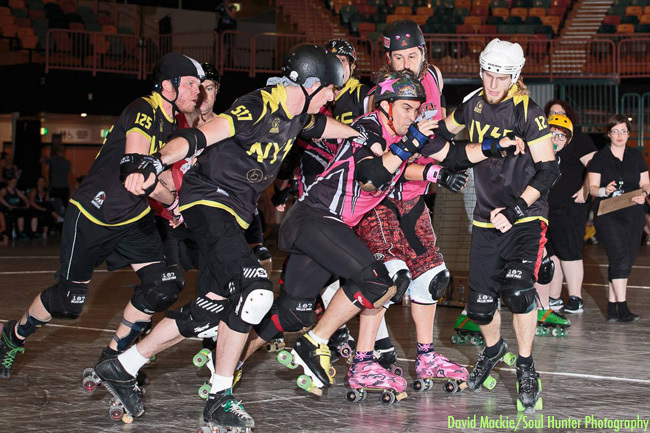 See a great big helping of roller derby action in Canberra on Saturday 11 April with not one but two awesome bouts in the one event: “Maulin’ Rogues”. Varsity Derby League‘s second women’s team, the Rogue Scholars, will be making their debut against the Wagga Derby Dolls’ Murderous Crows, and to warm you up for that, our men’s team, Capital Carnage, will play our women’s team, the DisHonour Rollers. This is going to be a smashing start to the VDL home season – don’t miss out! Bar and bake sale for all your refreshment needs, plus you could win prizes for supporting your favourite skater or team if you can make a decent sign (pro tip: derby people LOVE glitter and bruises). Time: Doors open 3 pm; 4 pm Carnage vs DHRs; 6.30 pm Scholars vs Crows. Buy online now (booking fee applies). Or at the door.